Because I am by nature an enthusiast, my tendency is toward involvement. Our children’s schools, committees of all sorts, online communities and personal projects. I write, speak when asked, and volunteer my time. One of my personal mottos is ‘complacency equals complicity’. If you care, don’t just sit there; do something. And lately, as my husband pointed out, my level of activity has really ramped up. I have been doing more and sleeping less, when I should probably be doing less and sleeping more. 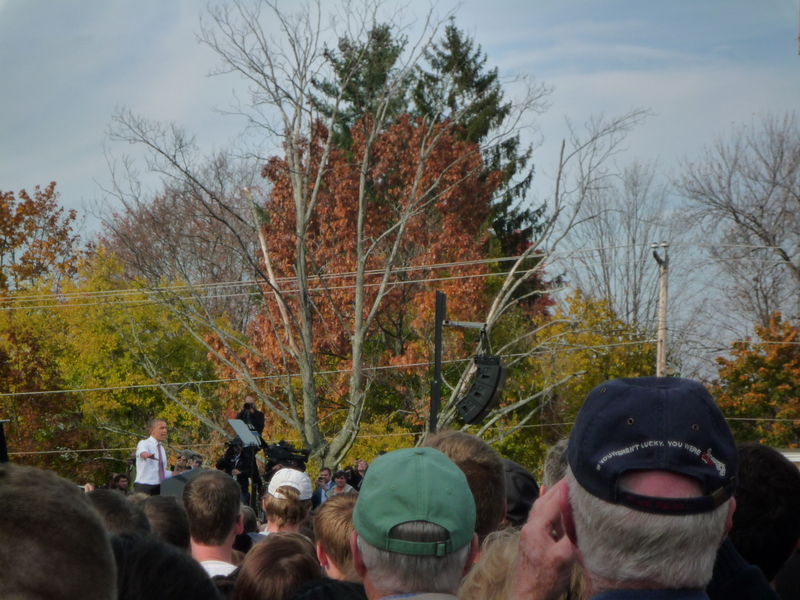 Over the weekend an unexpected opportunity came our way, as President Obama made a campaign stop in Nashua. David, Peter, my stepmother Carolyn– visiting from Texas and a registered republican but also a good sport– and I were part of a crowd of 8,500 who turned out in force to listen to our commander in chief. As we waited, we were treated to a brief concert and commentary by James Taylor; his spoken word just as thoughtful and entertaining as the music. Then President Obama stepped up to the podium to a thunder of applause; his remarks delivered with passion, urgency and eloquence. 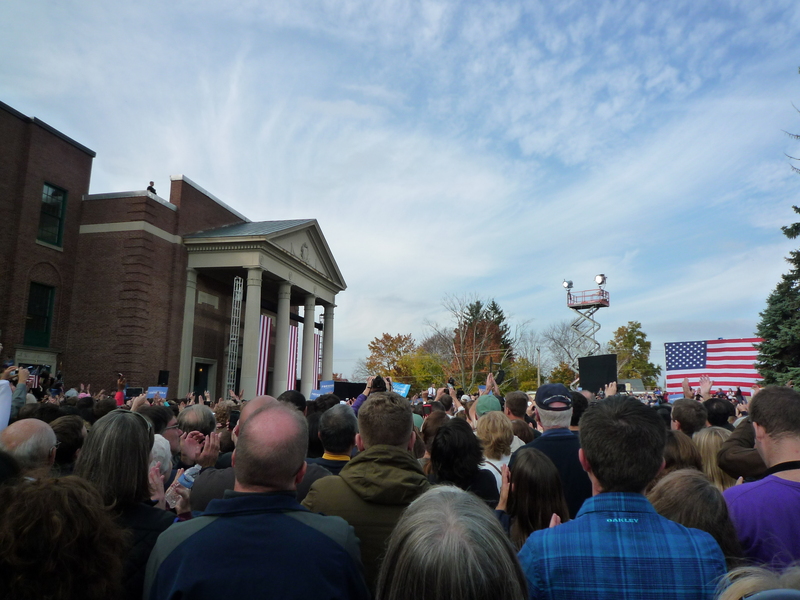 We were privileged to be in the audience for what felt like an historic moment. However, I had not realized that we would be on our feet the entire time; over four hours. Fortunately Carolyn was able to find a seat in the seemingly full bleachers. In her seventies, she is crippled from severe rheumatoid arthritis and has had both hips replaced. A lovely gentleman offered to move over so she could squeeze in beside him. It simply didn’t occur to me to try to find a seat as well, and I’m pretty sure I would not have garnered much sympathy even if I’d tried. The thing is, I look quite healthy. All things considered, I remain incredibly able. However, I need to accept that on occasion my intentions outstrip my actual stamina. Perpetual motion is a hard habit to break, but there are times when I should simply grab a chair (or a bleacher!) and sit for a spell. Acknowledgement of my limitations is not a sign of weakness, but rather common sense. I’m working on it! This entry was posted in Attitude and tagged accepting limitations of advanced disease, lung cancer, staying active. Bookmark the permalink. Let me be the first to second the motion that you take care of yourself, Linnea. And thanks for the Obamazoom! Sitting here like a duck, waiting for Sandy. Stay well, dear friend. Isn’t this the place where the gavel is swung? Motion passed! A good remind for yourself and for us to be mindful of what the body needs. And thank you for sharing your Obama watching experience. Very cool! Lorraine, it was great. No regrets; I’ll just bring a lawn chair should a similar situation arise. acknowledging your limitations will allow you to continue to soar! Amy, I’ve got to figure out a more friendly way to look at the word limitation. In other words, tweak it so that it somehow resembles potential. Always remember Linnea – inhale, hold, exhale, pause. Those pauses are important in yoga and in life. Hope Sandy is not causing you grief, just time to pause. Beryl, you are so correct. And it is not easy for me (of limited patience). Years ago during a semester abroad in France, my poetry teacher Gustaf Sobin remarked that if my writing were a sandwich, my words were too much meat and too little bread–a metaphor which has stuck with me. The moments in between provide context and support. Thank you for your wise words. I hope everyone made it through Sandy without any serious problems. Thankful power came back after 3 days without it. I like your idea of finding a new way to look at the word limitation. I’m not a sitting chef, I need to stand and move when cooking, but my lungs tell me I can’t do that for long anymore. I have been known to dance to loud music when making homemade sauce. Well no more tango with the tomatoes. Lynn, I am behind not just in blogging but everything post storm, but we got our power back on Thursday. I am laughing at the image of you tangoing with tomatoes–you might have to learn some chair dances 🙂 And yes, let’s work on making limitations our friend: I am thinking of limitations that are protective barriers, keeping us from harm (including that which is self inflicted).